ST. GEORGE — The St. George Branch of American Association of University Women has selected Ivins resident Jeannette Seloover Johnson to receive its 2015 Distinguished Woman of the Year Award which honors a woman for her personal qualifications and contributions to society on a local, state or national level. 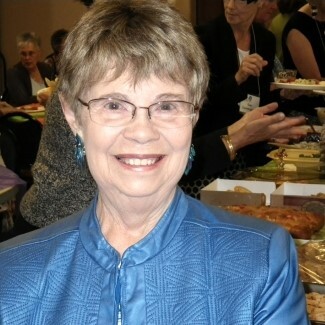 Johnson has been a member of American Association of University Women, or AAUW, for over 40 years and for the last nine years has served the St. George branch as the education, public policy and legal advocacy chair. According to AAUW St. George’s release, Johnson believes that AAUW empowers women and has supported its mission of advancing equity for women and girls through advocacy, education, philanthropy, and research. A native of Milwaukee, Johnson earned her undergraduate degree in exceptional education-hearing impaired, at the University of Wisconsin, Milwaukee, her master’s degree and doctorate in communicative disorders at Northwestern University, Evanston, Illinois. Early in her career she was on the faculties of the University of Southern California, Central Washington State University and the University of New Mexico. Johnson served in the U.S. Peace Corps as consultant in audiology to the Republic of Korea – the only audiologist in the country at the time. She founded two nonprofit organizations, was employed by the Province of British Columbia Ministry of Health as hearing consultant and managed clinical research in hearing devices and cochlear implants at the 3M Company, St. Paul, Minnesota. As vice president of corporate regulatory, quality and clinical affairs at ReSound Corporation in Redwood City, California, Johnson contributed to the successful opening of European and Asian markets and participated in preparing the company for its successful initial public officering. Before retirement, she served as vice president of research and planning, and regulatory affairs at Sonic Innovations in Salt Lake City throughout its early years as a venture-funded company and as it too became a publicly traded company. The Distinguished Woman of the Year Award is an initiative of AAUW of Utah. The recognition is nonpartisan and open to women residents of Utah, with a minimum of a baccalaureate degree, who have demonstrated their commitment to women’s equity, advancement and education. They do not need to be AAUW members. Each of the state’s five branches selects its own distinguished woman. Johnson will be honored during the St. George AAUW Annual Scholarship luncheon Monday at the Courtyard Marriott in St. George, from 11 a.m. to 1 p.m., when 13 college scholarships will be given to local area women. The luncheon is open to the public; reservations may be made online. The American Association of University Women is the nation’s leading voice promoting equity and education for women and girls. Since its inception in 1881, AAUW members have researched and taken positions on the fundamental issues of the day: educational, social, economic and political. The AAUW St. George Utah Branch, founded in 1981, is an extension of the National AAUW and is the largest Branch in Utah. Their mission is to help advance equity for women and girls in Utah through advocacy and education.